June 1967. Yes, fellow, Flashionados, the summer of love has finally arrived. Now I realize that the dating of comic books back in the day was usually a bit ahead of the pub date displayed on the cover, but that’s merely a technicality. I’m sure this book was sitting on the desk in my room when the big summer of love bang exploded, which, by the way, happened at the stroke of midnight on June 1st. How do I know that with such exquisite precision? Because June 1st was the day that the Beatles magnum opus Sgt. Pepper went on sale. A mere two weeks later, the Monterey Pop Festival took place and the confluence of these two events changed everything. Pepper was on the radio everywhere and the seismic changes that were about to take place in the world suddenly had a soundtrack. If I may, allow me to drive the point home with a brief digression about my personal intersection with Pepper. It was finals week at Kent and one particular final in my philosophy class just happened to land on the morning of June 1st. The final exam in the class was at 10:00… which was also the same time that the record store in downtown Kent opened. And inside that store the very first copies of Sgt. Pepper would be for sale. So I found myself faced with an immoral dilemma (when someone else is paying for your college education, trust me, it’s an immoral dilemma even if I did pay some of it back down the road). Do I go to my philosophy final and drive the final nail into a course that was going rather sadly for me educationally speaking, or, do I listen to what my heart, head and every fiber in my being was telling me to do and go get that copy of Pepper. I was a walking cultural war. On the one hand was the accumulated wisdom of generations of deep philosophical thinkers, and on the other hand was my thinking. I made a call and chose popular culture over established culture and never looked back. So instead of kicking back with Kant and Kierkegaard, I was in my dorm room rockin’ with Rita and Rigby. It would have been an even braver decision if, when the incomplete showed up on my grade report, I hadn’t called up the philosophy department and lied about being at the exam. They were very nice and allowed me to return after a couple of weeks to “retake” the exam. I used those two weeks to actually read the textbook (while listening to Sgt.Pepper of course) which turned out to enhance my understanding of philosophy considerably. Happy ending. I went back and this time aced the exam. Talk about having your cultural cake and eating it too. 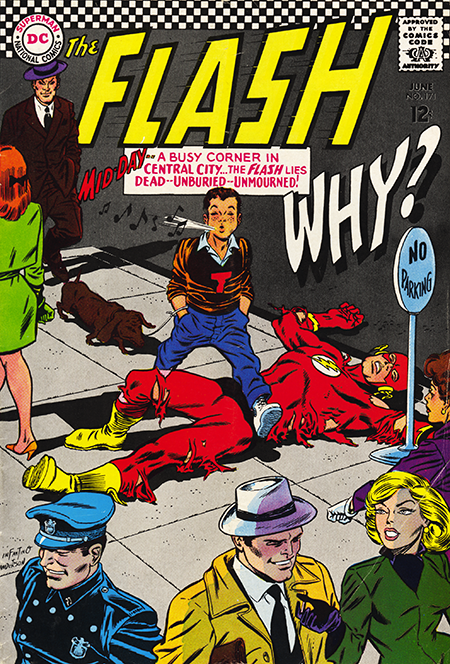 Sometime, while all of this transpired, The Flash #171 showed-up and turned in a well above average Flash tale featuring Dr. Light (who should have been featured on the cover). Digression number two: Dr. Light, even with a uniform that was slightly retro even then, was a classic character-you-like-to-hate Silver Age villain. The fate that awaits him in the future at the hands of modern writers is truly disgusting. But, that’s not the purview with which this blog has been charged. Anyway, the tale was a classic romp between the Flash and Dr. Light and even brought in Dexter Miles the curator of the Flash Museum for a killer splash page showing him shooting the Flash (it was really Dr. Light in disguise). The story even includes some flashback sequences showing Dr. Light battling the Justice League in JLA #12, the Atom in Atom #8, and Green Lantern #33 (with Carmine turning in a very credible Gil Kane GL pose). A classic Silver Age story very well done. Nowhere in site, however, do the middle-aged men who created this gem make any reference to the cultural maelstrom unfolding outside their office windows on Earth Prime. I frankly doubt they were listening to Sgt. Pepper’s call to arms.